It’s understandable if the very thought of a John Lennon covers project-especially an instrumental jazz John Lennon covers project-nearly gives you a rash. The end result, in all likelihood, might make for an excellent soundtrack to an elevator ride, right? All we are saying, however, is give Bill a chance. Bill Frisell’s current Lennon-focused project, in support of last year’s All We Are Saying… album, is an absolute joy, one that strengthens the guitarist’s own legacy while honoring that of the former Beatle. It’s not a gimmick, but rather an absolute clinic for how a pop-rock songbook-even one as legendary as Lennon’s-can be translated into mesmerizing jazz-speak. That was certainly the case when Frisell brought his mighty Lennon tribute band, featuring pedal-steeler Greg Leisz, bassist Tony Scherr and drummer Kenny Wollesen (all of whom performed on All We Are Saying…), to the 33rd annual Montreal International Jazz Festival for a performance at Club Soda. The show began, just like the album, with an appropriately spacey version of “Across the Universe” (from the Beatles’ Let It Be). The players, huddled closely together on Club Soda’s stage, noodled softly to start, producing music that felt so introspective it was almost like we were hearing something not intended for the public. It took a while for the melody to rise and become recognizable, but once it did the effect on the crowd was dramatic. 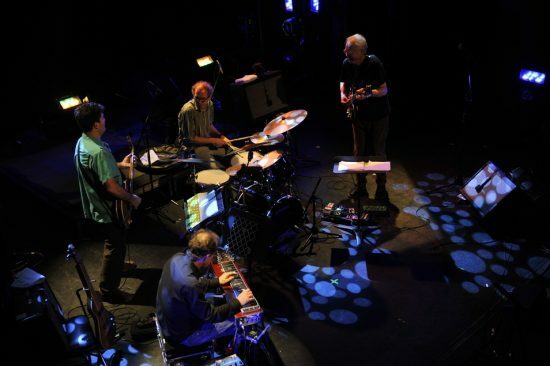 That process would repeat throughout the night, as Frisell and company would open a song in the netherworld and then gradually bring it back to earth. When it landed, the song was usually greeted by hundreds of smiles, as fans were flooded with all the many personal memories associated with these Lennon/Beatles classics. The feel of the music changed course with each song, going from the wrenchingly emotional “Beautiful Boy (Darling Boy)” (from Lennon’s Double Fantasy) to the joyous “You’ve Got to Hide Your Love Away” (from the Beatles’ Help!) to the all-out jazz-rock fusion of “Come Together” (from the Beatles’ Abbey Road). Frisell and Leisz proved to be formidable pair, combining in ways both elegant and electric. At their most exquisite, the players were able to do more than just conjure up the lyrics through their guitar work; they were able to evoke Lennon’s voice as well. The best showcase of the night, in that regard, was the achingly romantic “In My Life” (from the Beatles’ Rubber Soul). The rhythm section was equally superb, especially on the fun “Please Please Me” (from the Beatles’ album of the same name) and during the trippy take on “Strawberry Fields Forever” (from Magical Mystery Tour) that came during the encore. The show closed with the Lennon anthem “Imagine” (from Lennon’s album of the same name), which served as a fitting farewell on a night that had been filled with nearly unimaginable musical delights.